As die-hard fans of Top Chef and the colorful Richard Blais (who will hopefully take home the prize next week) I had booked my birthday dinner at his new digs, Home (formerly the amazing Seegers). However, as Jennifer Zyman’s Blissfulglutton review noted that it fell short, and realizing that Blais was probably out of the kitchen taking care of his newborn baby girl, we decided to hold off on Home and instead head to another establishment here in town we’d never managed to visit – Linton Hopkin’s Restaurant Eugene. Between Hopkin’s 2008 nomination as best Southesast chef from the Beard Foundation to his appearance on Iron Chef America, not to mention the to-die-for pork belly with jerusalem artichoke pickles and chow-chow I sampled at a recent festival here in town, and the stellar reputation of mixologist Greg Best, I knew this was probably going to be a great meal. Oddly enough, online reviews of Eugene were hard to find, and most comments on sites like Yelp and Atlanta Cuisine focused on how much more hip Hopkin’s new Holeman & Finch Public House was as a venue. We decided to brave the reported preponderance of Buckhead blue-hairs (of which there were a few, but balanced by several young couples, as well as at least one family with a tween-aged boy in their midst). The meal was fabulous. Our server had a tendency to mispronounce some ingredients, but was very helpful nonetheless. I was immediately excited to try one of the cocktails from Best’s menu – I selected the light combination of brut champaigne, dubbonet rouge, Regan’s bitters, and sugar. Their wine list was full of interesting choices – we selected a Merry Edwards Sauvingon Blanc, a wonderful (and difficult to find) wine full of zing – very fruit-forward with notes of citrus and mango. I’d never had her white wines, only her amazing Pinot Noirs a few times over the years. If you can find this one – try it. Amy’s uncle, who is also quite the foodie, joined us for dinner. As he is on a no-fat diet as he’s having a gallstone removed in a few weeks, the server managed to work with the chef (not sure if Linton was in the house or not – we did not see him) to create adaptations of both an appetizer and entree for him. Gary had an appetizer of seared scallops with a puree of jerusalem artichokes and parsley that turned out incredibly well, and a no-fat variation of their tasting of local veggies for his entree, presented in a lovely shallow copper pan, featuring beets, peas, greens, favas, fennel, sunchokes, potatoes, turnips, carrots and bok choy. Amy and I both first selected the cold soup of georgia english peas and buttermilk appetizer, served with a fritter of crab and asparagus floating in the middle with a touch of mint clabbered cream added at the last moment. However, moments after ordering, I saw the beautiful tempura of Tybee Island white shrimp appetizer served at a neighboring table, and had to try that (pictured at top). Featuring gorgeous shrimp from my hometown, how could I really resist? 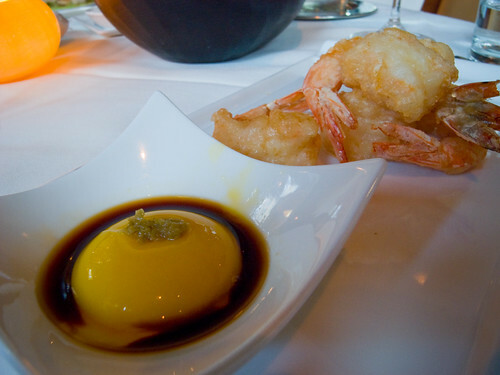 The ginormous shrimp were accompanied by a dipping sauce of organic soy and yuzu kosho with a perfect unbroken local farm egg yolk in the middle. After breaking the yolk to mix with the other ingredients, the spiciness of the yuzu kosho blended with the salty soy and unctuous egg to make a most memorable dipping sauce for those perfect shrimp. A great start. Amy’s soup – of which I received one spoonful – was all velvet – wonderfully fresh tastes of pea and cream and buttermilk with perhaps a touch too much salt for my taste. But still very nice – and Amy said the fritter was among the best crabcakes she’d ever tasted. For entrees, Gary had the aforementioned veggie tasting. Amy selected the sauteed wild Alaskan halibut, combining a somewhat far-from-farm/local ingredient (impeccably sourced all the same) with plenty of local goodies – local roasted baby onions in a carnaroli risotto, ‘little pig’ mushrooms, lemon gremolata, with a touch of high-grade EVOO and cherrywood-aged balsamic vinegar. Perfectly seared, the dish was spot-on, with a lovely mix of flavors. I was blown away by my entree as well. 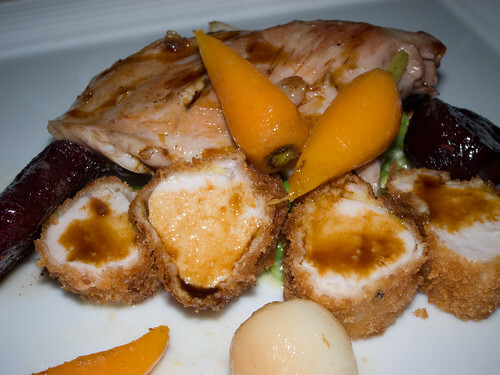 The duo of Mississipi rabbit featured a sous-vide leg (although I think it was in reality of thigh) which appeared to have been pan-seared and along with the loin crisped with a light (panko?) breading. The vegetables included CO Farms baby carrots (‘natch) as well as Hakurei turnips, baby beets, and a bed of creamed Georgia English peas. All topped with a flourish of rabbit jus, applied tableside. I was a very happy camper. The loin was almost buttery with that very light crisp accent on the outside, the peas were simply wonderful, and the other veggies all provided a wonderfully varied selection of tastes. Really nice. For desert, we had their version of Ms. Edna Lewis pound cake, presented atop kumquat jam (packed by the Hopkins’ kitchen last season) along with Tupelo honey and balsamic vinegar around it, with a sweetened whipped cream and crisped pecans on top. A lovely and necessarily light finish to the meal. Before heading home, we ducked into the raucous (at 11pm) Holeman & Finch next door (b&w photo, upper right). The hanging charcuterie certainly looked inviting, as did the open kitchen. We’ll have to try that for a more causal evening out. 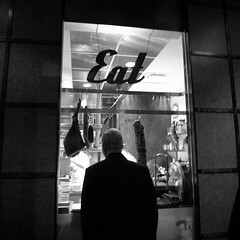 Who can’t be intrigued by a place where the chef announces over the P.A. that ‘this is not a drill – it is now burger time.’ I can only imagine what goodies go into that burger! Here are all the photos from the evening.